Clowns, scorpions, and goats, oh my! 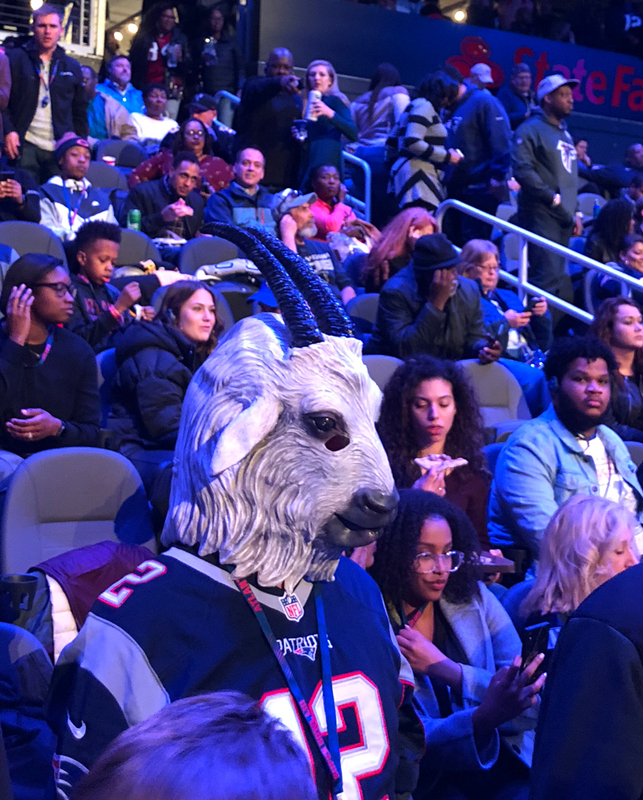 Super Bowl Opening Night is known for being, well, weird. The spectacle, formerly known as Media Day, is officially a giant press conference. It’s the only time the two teams, staff, and coaches will all be in the same place, and it’s the media’s first chance to get all their burning big game questions answered. 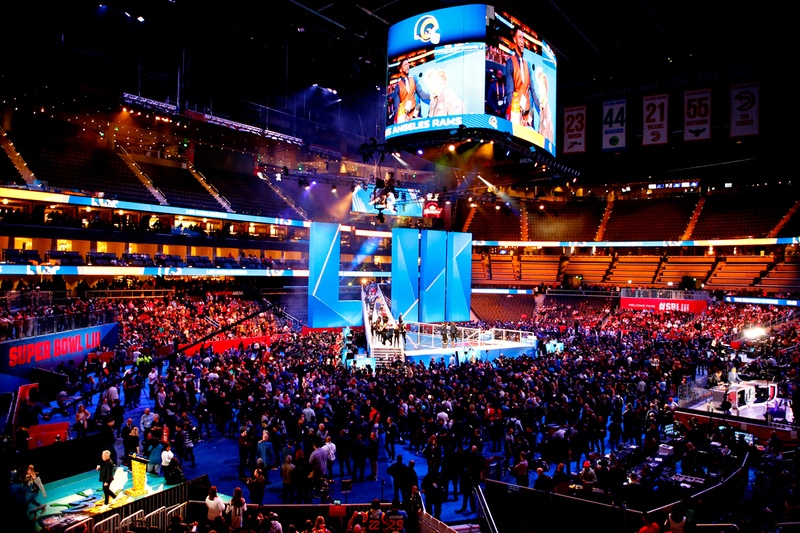 The way it works: Each team comes out for an hour, with star players and the head coach set up at podiums, the others roaming the floor. The media swarms the podiums and wanders around, getting in whatever questions they can. The thing is, half the time, those questions have nothing to do with the Super Bowl. Or football. Sometimes, they’re not even questions but activities, like being asked to eat a scorpion or solve a Rubik’s Cube. (For those not in the know, G.O.A.T. = “greatest of all time” = Tom Brady for most Patriots fans.) 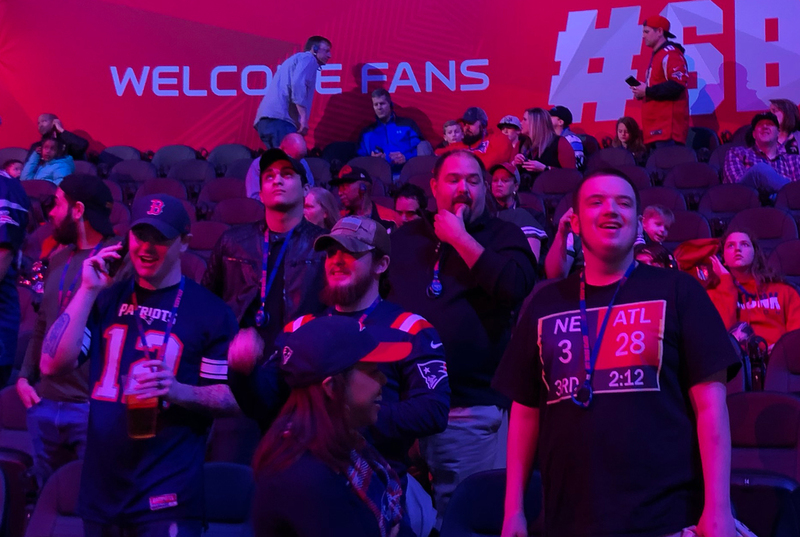 Patriots fans greatly outnumbered Rams fans at the event. 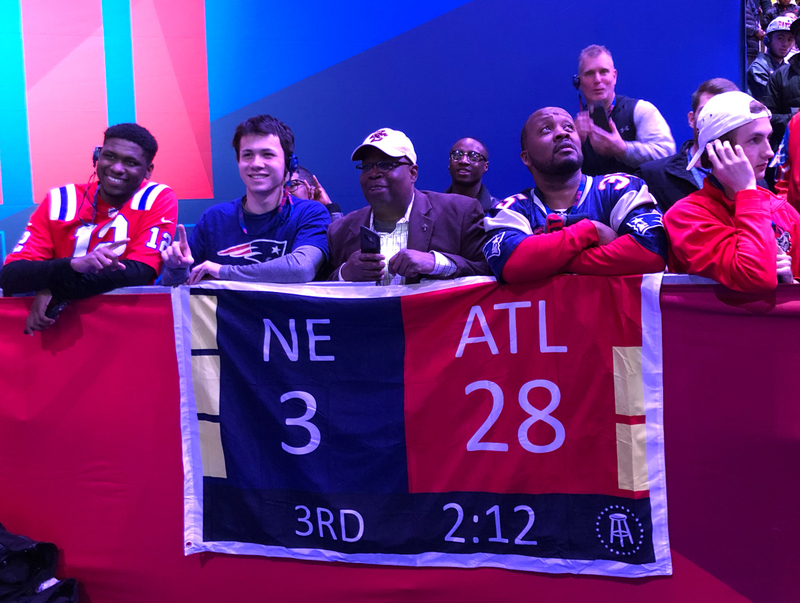 Even though it’s been two years since the Falcons lost Super Bowl LI, Patriots fans can’t resist just getting in a few jabs to the hometown team with “28-3” banners and T-shirts, the lead the Falcons had in the 3rd quarter in Houston before everything came crashing down. 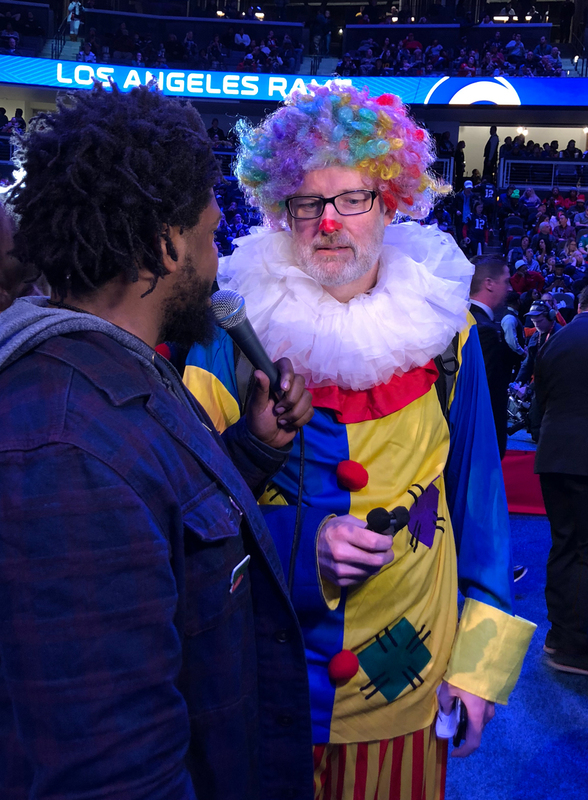 Who is actually Dan McDowell of the Ticket, a sports radio station in Dallas, Texas, according to NJ.com, where he told reporter Matt Lombardo that he “does something crazy” every year as a way to honor his late father, who would always look for him during Opening Night broadcasts. Which belongs to Atlanta’s Fox 5 reporter Cody Chaffins. He also brought the “High 5 Hand” to Houston back in 2017. 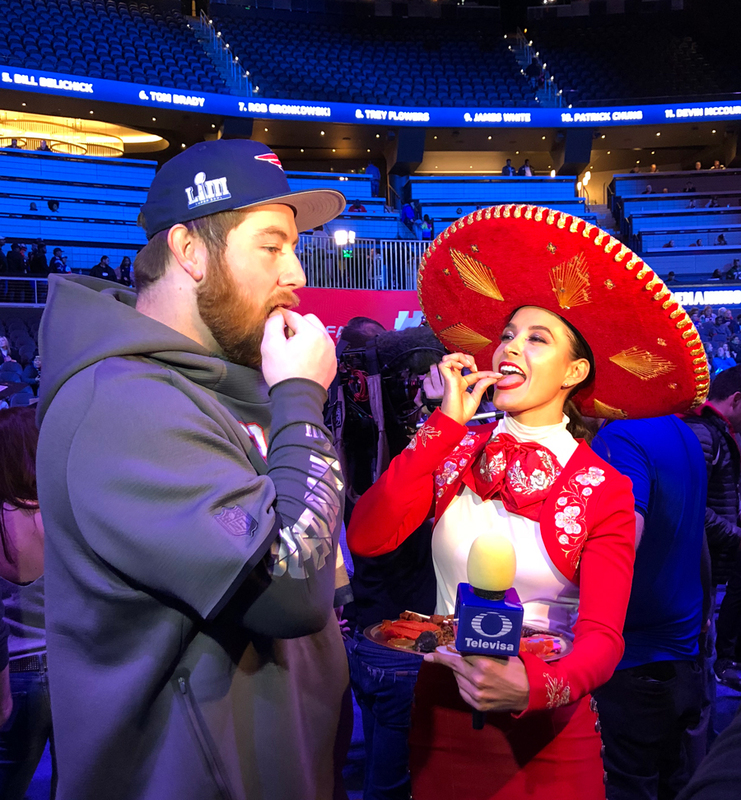 Georgina Holguín with Mexican sports network Televisa Deportes is no stranger to Super Bowl Opening Night. This year she brought a plate of insects, including scorpions, and asked players to try them. Above is Patriots guard Joe Thuney. Getty Images photographer Kevin C. Cox got the photo of the night with this shot of the Rams’s Ethan Westbrooks reacting to a scorpion. 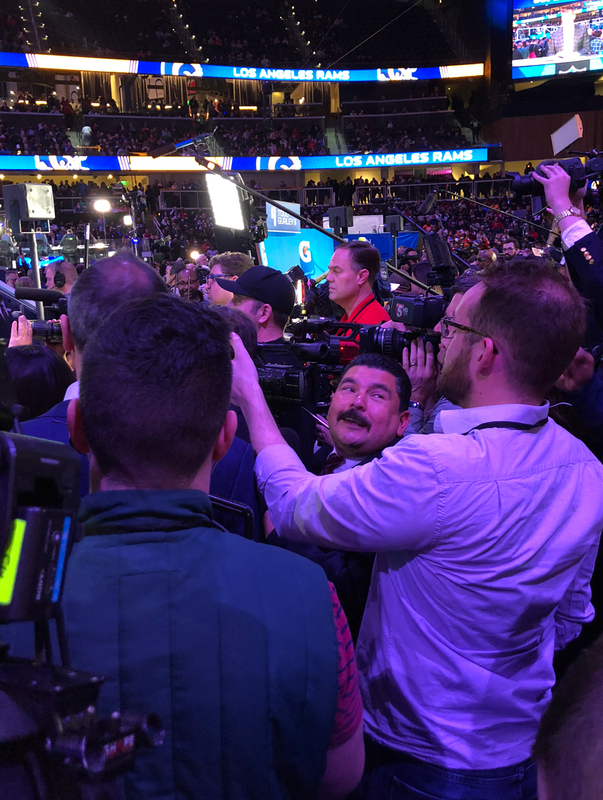 Another regular at Super Bowl Opening Night, Guillermo Rodriguez, the Jimmy Kimmel Live! 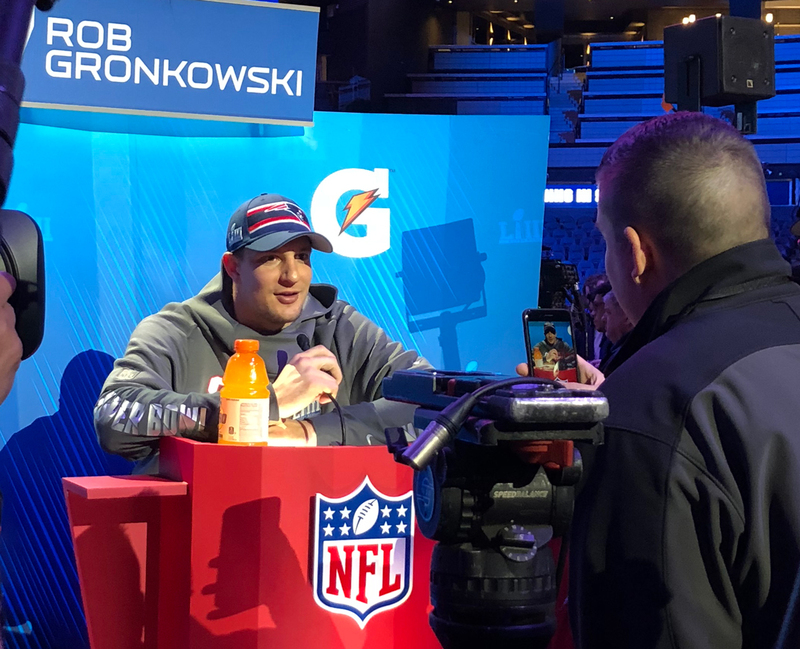 “security guard,” roamed the floor talking to the podium-stationed players, including asking Tom Brady to autograph a pillow with his face on it. (Brady then gave Guillermo a hug.) The full segment hasn’t aired on JKL yet, but expect it soon. "Hell yeah I'll give you a hug." If you don’t recognize the man in the above photo, you are likely not a millennial. 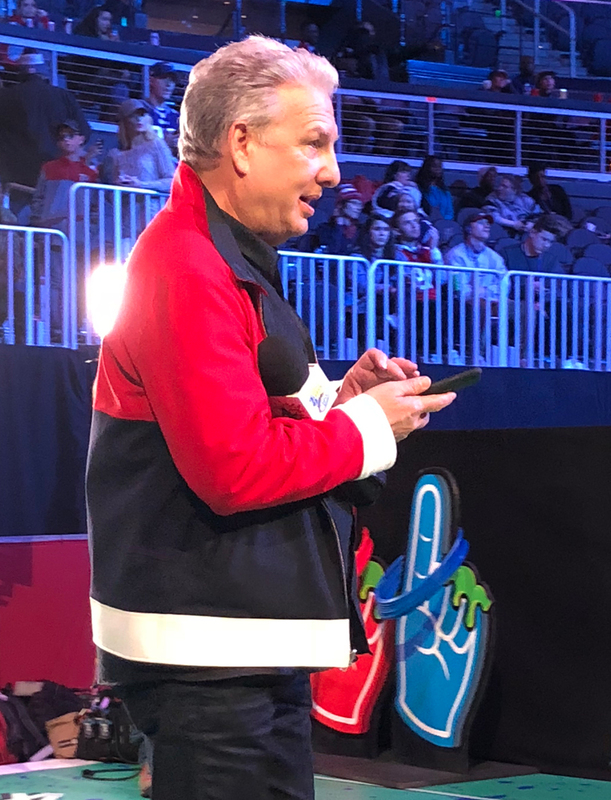 That would be Marc Summers, the host of 1990s Nickelodeon game show Double Dare (and also the host of Food Network’s Unwrapped). 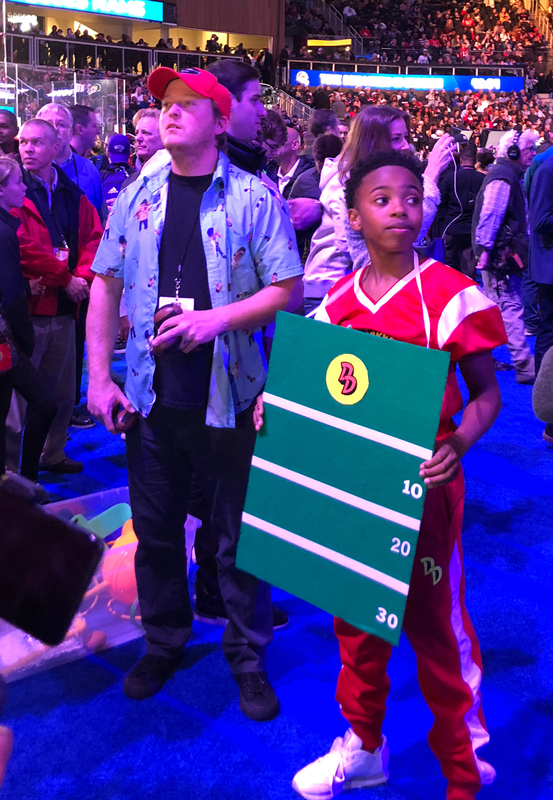 Nickelodeon is doing a Double Dare at the Super Bowl special, which will tape at the Super Bowl Experience on Thursday and air on Sunday and features Saints quarterback Drew Brees and Seahawks quarterback Russell Wilson. 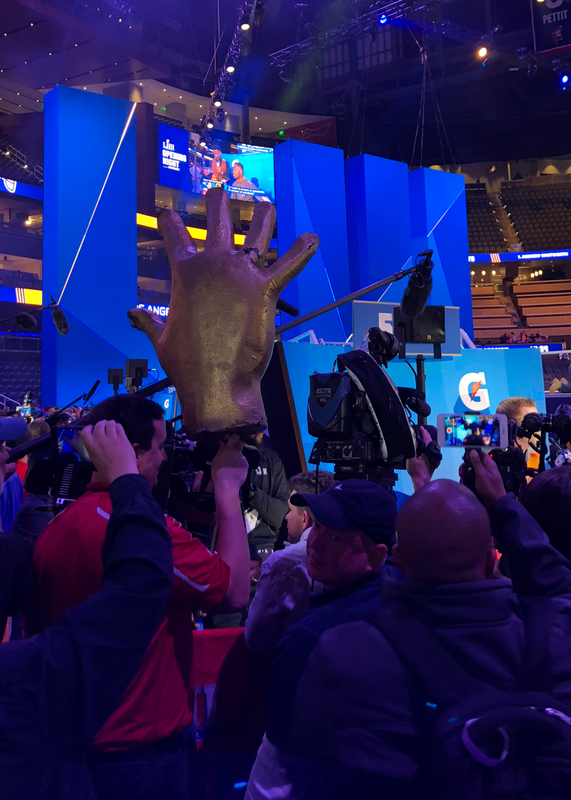 During Opening Night, the Double Dare team roamed the floor, with a kid correspondent who had players throw mini footballs into a helmet perched on top of his head or at a Velcro sandwich board. 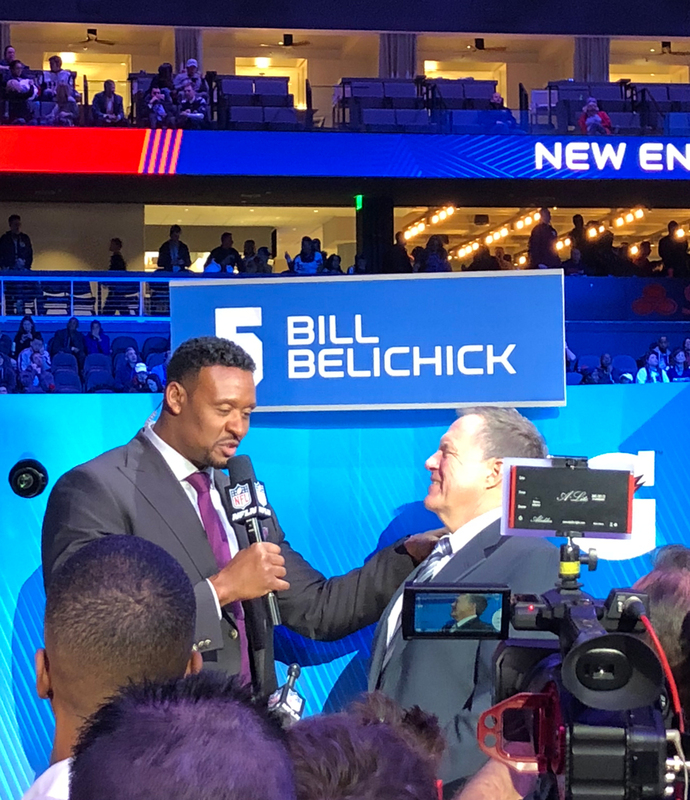 The Patriots coach is notoriously curmudgeonly at Super Bowl Opening Night, so much so that the NFL did a “smile counter” during last year’s event. But we managed to see him crack a few grins. 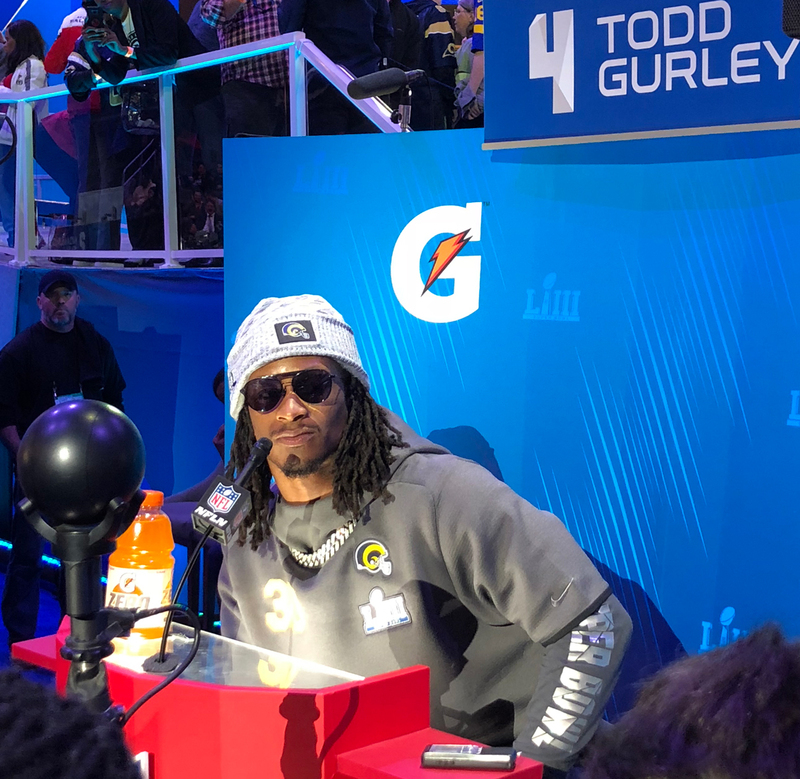 The former Georgia Bulldog and current Rams running back looked extremely cool sporting sunglasses on the podium. He assured the media his knee injury wouldn’t be an issue in Sunday’s game. 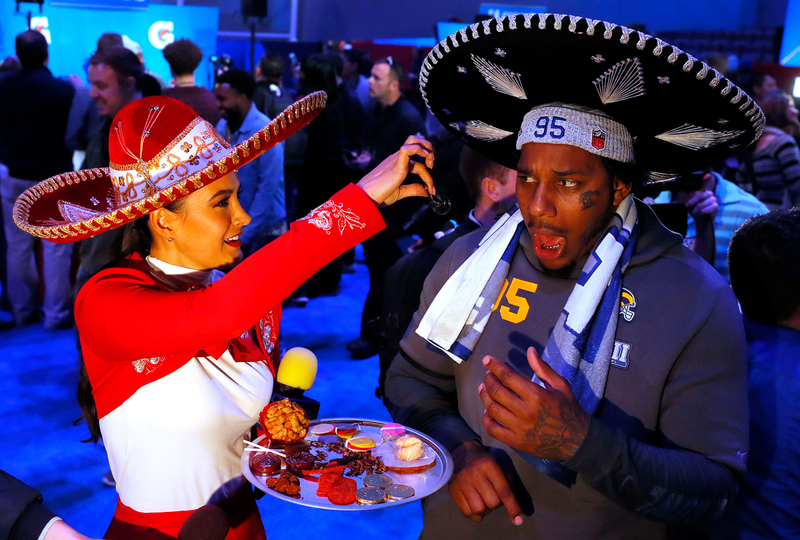 The Patriots tight end and perennial fan favorite had to skip last year’s Opening Night due to concussion treatment, but this year he didn’t disappoint, dancing on stage, answering goofy questions, throwing the aformentioned Double Dare mini footballs, and wearing a sombrero loaned to him by Televisa’s Holguín.